I am always on the lookout for creative nursery decorating ideas featuring baby ultrasound pictures that go beyond just having the print framed. Not that there's a thing wrong with framing your baby's ultrasound picture in a document frame and using it as part of an arrangement of art on the nursery wall but isn't this much nicer? 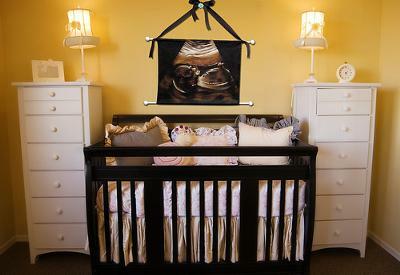 I love the black satin ribbons tied into a bow and attached to the wooden dowel rods that were used to hang the piece. Take a minute to look at the nursery photo above and picture in your mind the photo that was the inspiration for the artwork in a black document frame sitting on top of one of the chests flanking the crib with the subject of the wall hanging something like...a giraffe or a jungle scene. Ok, now tell me in which scenario does the most precious photograph that any mother ever sees have the most impact. Actually, there is no need to tell me since I already know the answer! The advantages of having a talented artist like Christina Hummer (who by the way was responsible for painting this wall hanging) paint an ultra-silhouette using your own ultrasound picture is obvious! She takes the black and white print, dresses it up and creates an amazing piece of art that complements the color scheme of your nursery. I love how she maintained the monochromatic properties of the picture yet made it softer and more in keeping with the color of the baby's crib using a rich chocolate brown and antique white paint colors. Another benefit of having a painting made is that the image is so much larger and decorative than the little bitty picture that is so small you can barely make out the details. This way the canvas can be colorized, sized and personalized according to your specifications. I'm not sure that the same pleasing results as the ones we see here would be duplicated if the photo was painted in baby blue, pink or even lime green ala Andy Warhol style. But you must admit that the ultra silhouette painted in these colors is pretty cool. baby ultrasound pictures I would like to invite you to share them with us. Moms are always looking for unique ways to show off those precious first pictures we see of our babies! And speaking of Andy Warhol,maybe a painting in bright, bold colors would be very cool in a modern nursery design. In fact, I can see where a very large painting in wild colors might be just the thing. IN the right room this would be amazing! I recommend that you browse through Christina Hummer's photo gallery for ideas on decorating your nursery walls. If you need a painting of you baby's ultrasound or some custom artwork this lady that can take care of whatever you may need. You can reach me at sweetdreammurals@gmail.com, or visit my Etsy store to make a purchase. I am still waiting on contact info for Christina Hummer. Might you have the contact information on who does these? Would love to purchase and more info. How can I get in contact with Cristina hammer? I would like a canvas photo of my baby's ultrasound. The paintings are done on canvas with acrylic paints and available at sizes 11x14" and up. The dowel rods and matching ribbons are included in the price as well! They start at $60. Does the artist just do a canvas or does she include the hanger and ribbon, too? Love these!! What a great idea! 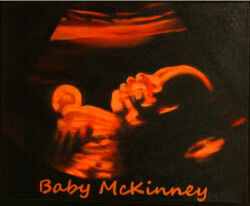 These baby ultrasound paintings are so unique! What an awesome and treasured gift this would be. Amazing talent and imagination! Join in and write your own page! It's easy to do. How? Simply click here to return to REAL NURSERIES & BABY SHOWERS .